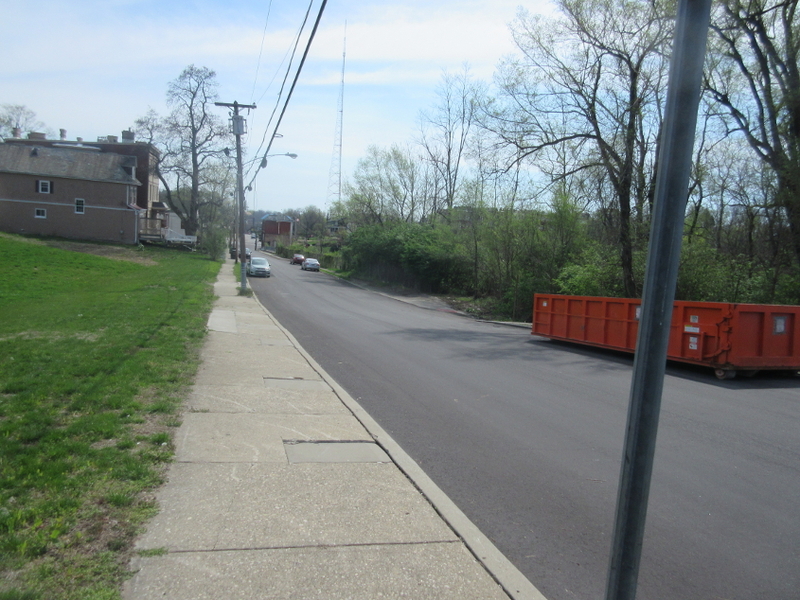 This Roads Scholaring with the Road Ruiner centered on Mount Auburn. This event wasn't spectacular, but it wasn't horrible either. Northeast on US 22/OH 3 - Gilbert Avenue - at the end of the Gilbert Avenue Viaduct. 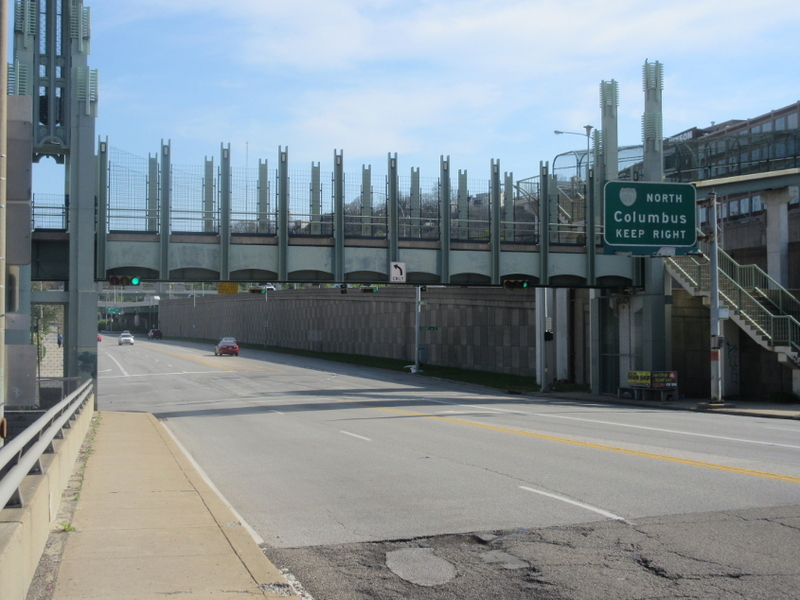 The walkway at Court Street - which reportedly opened in 1970 - goes over the road. The once-vibrant I-71 shield on the BGS is faded beyond reclamation. O what a find! 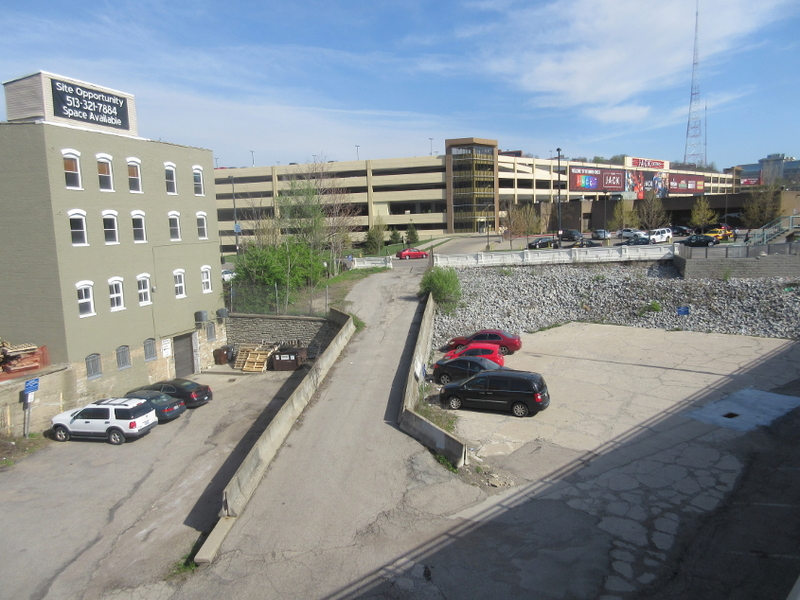 Looking north from the Gilbert Avenue Viaduct, this is a remnant of Lock Street. It intersects Court Street up ahead. Steps are roads for knee people! On Young Street at Pueblo Street, this is looking down a set of steps that forms part of Young. 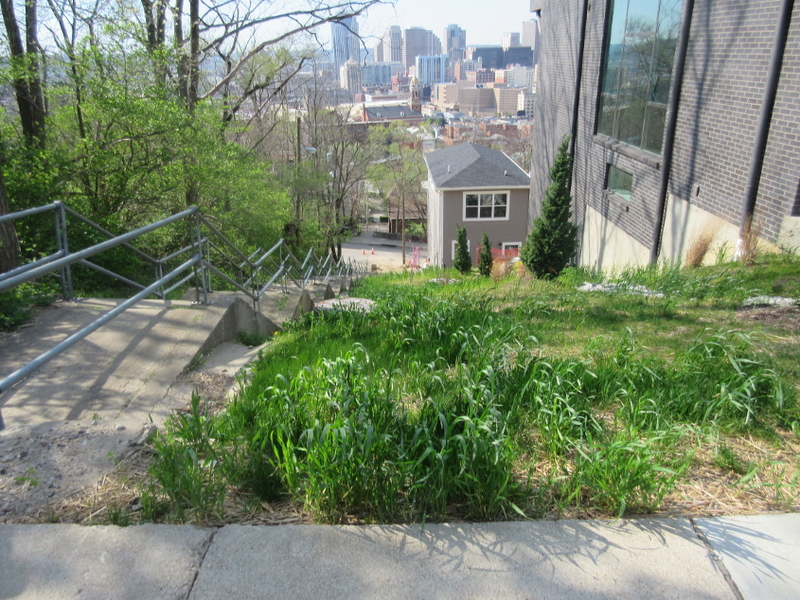 The steps intersect Boal Street up ahead. I thought Pueblo Street was gone, but this is looking down Pueblo from Young. Apparently, it looked even cooler just a couple years earlier, before it got that boring wall at Filson Park. 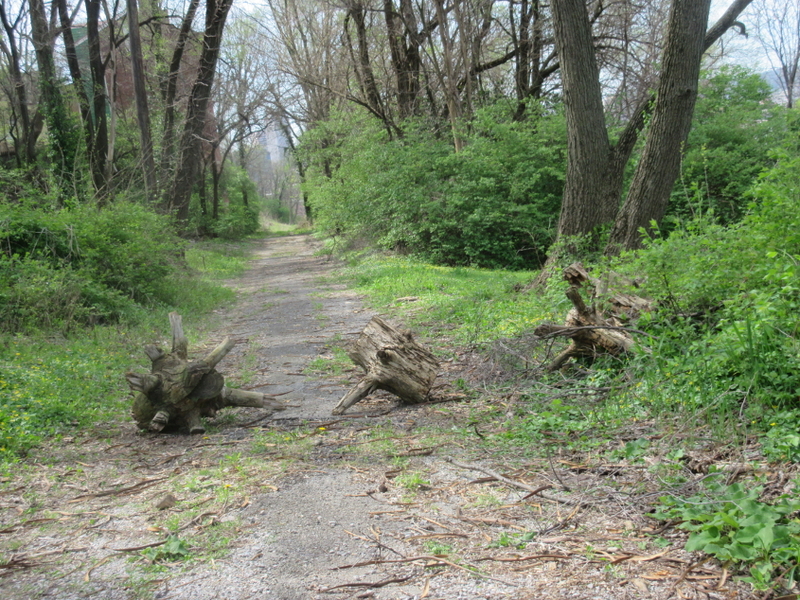 Ringgold Street apparently used to run where this trail is. 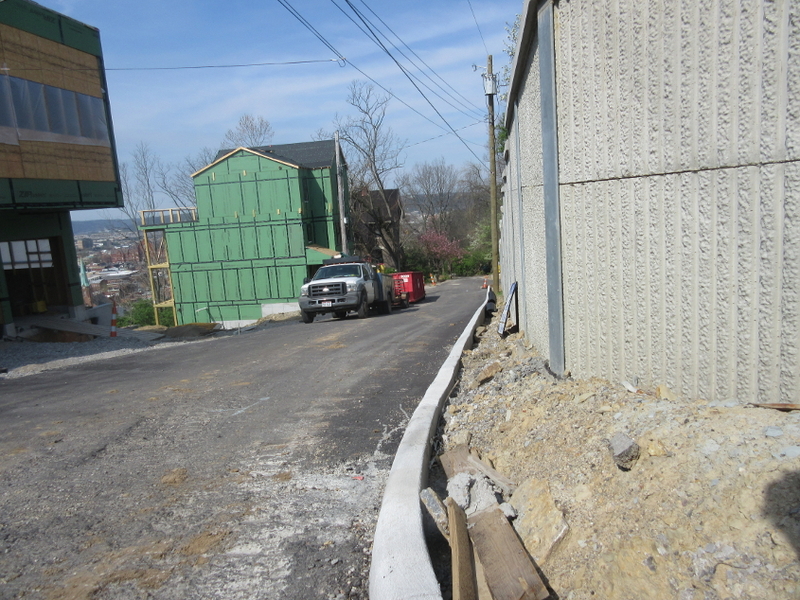 Continuing on the old Ringgold approaching Walker Street. 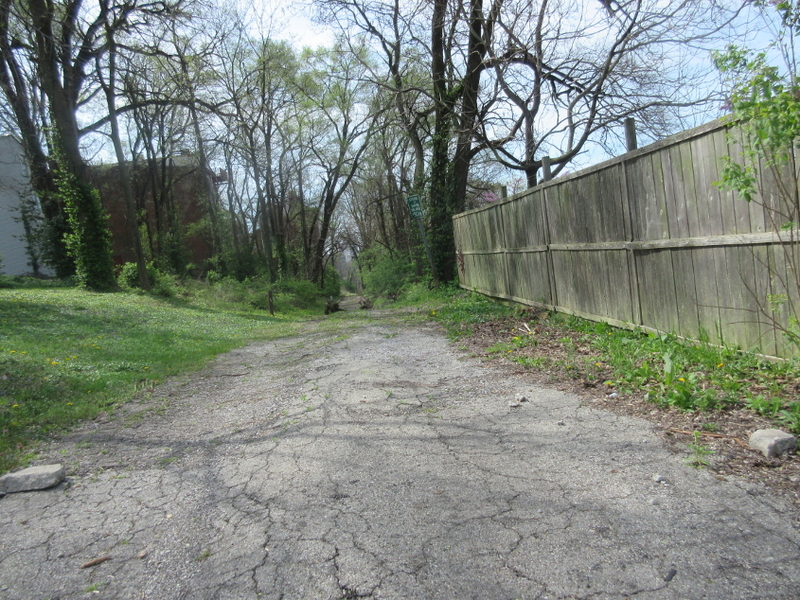 Although official maps show that it's still a public right-of-way, the trail really narrows next to that house and you end up feeling like you're trampling private property. It's like when I was growing up in Highland Heights, you used to be able to squeeze between houses to walk from the end of Tammy Lane to the end of Elblaine. North on Auburn Avenue. The 5-way intersection up ahead marks the end of Sycamore Street. Looking up Sycamore approaching its end. 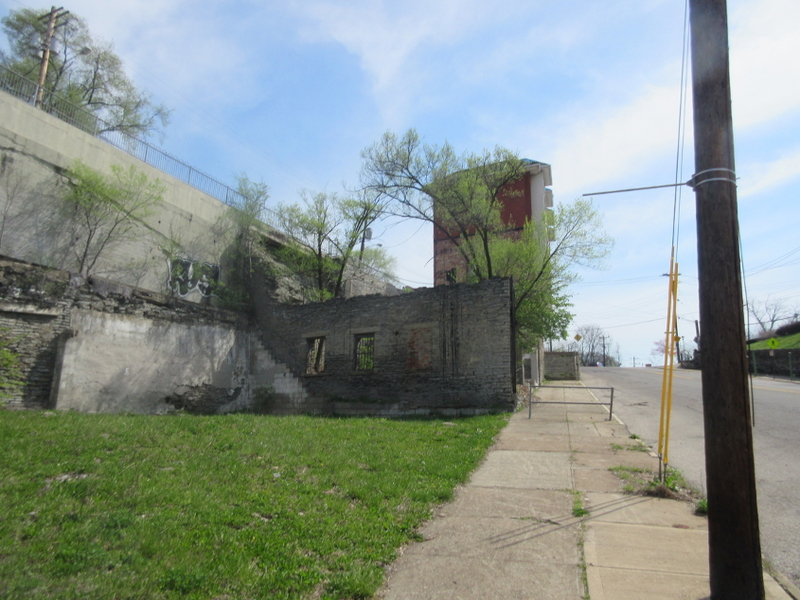 The wall with windows, with the higher wall behind it for Dorchester Avenue, makes this look like an old fort. Looking the other way on Sycamore. 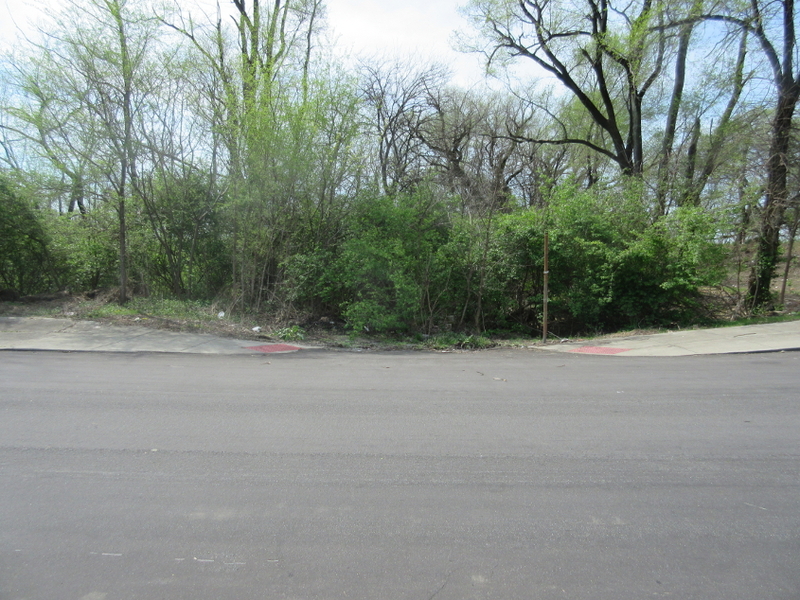 The clearing on the right - directly ahead - was the site of a now-defunct road called Edinburgh Place. The best find of the day! 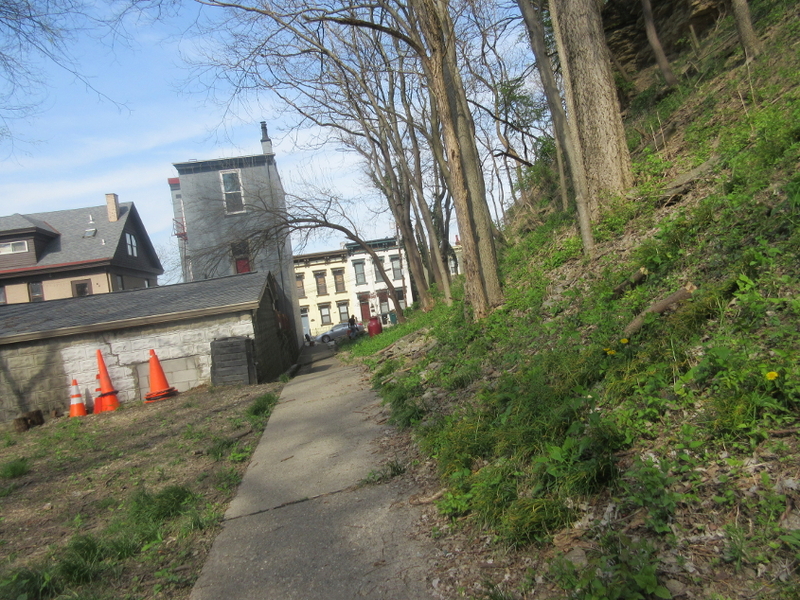 This is Alma Street (formerly Davis Street), off Sycamore. There was still a sign for this street, but the road is just about abandoned. Continuing on the disused Alma. 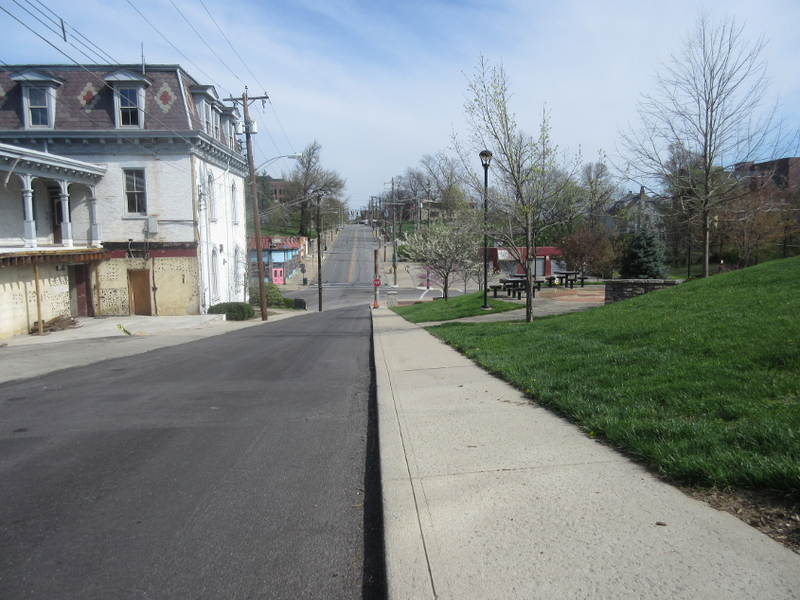 Looking south on Dorchester, where McIlvaine Street or Auburn Terrace used to be. 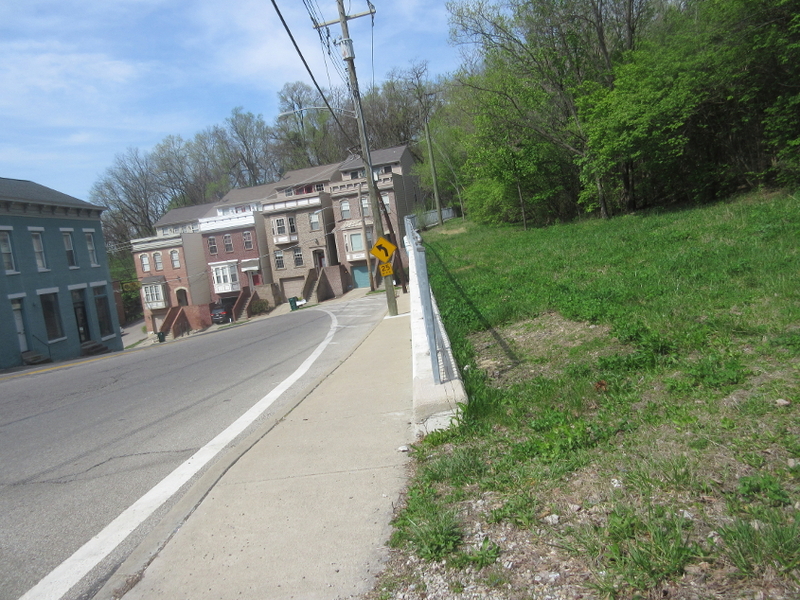 McIlvaine was straight ahead where the gap in the sidewalk is now. 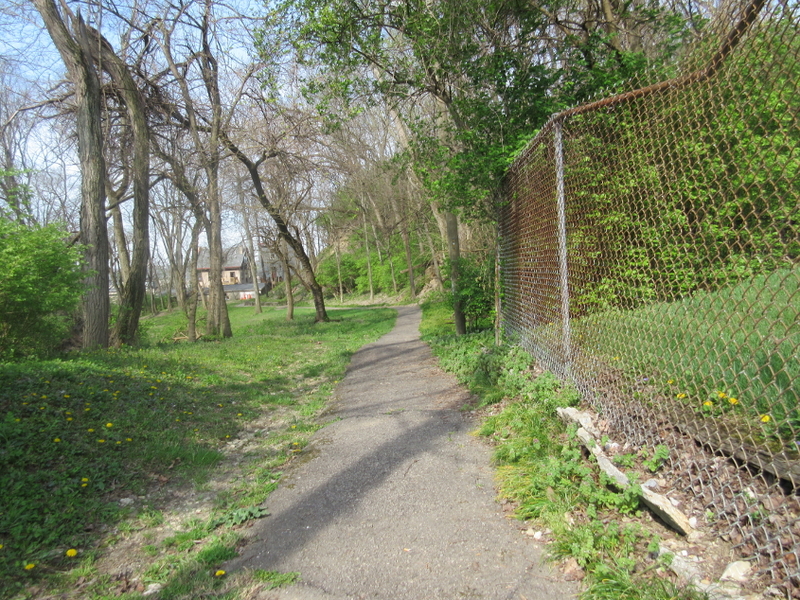 A Channel 12 documentary from 1964 about poverty showed McIlvaine at the intersection with the now-defunct Excelsior Street, looking steeply up to Dorchester, but that junction is now buried deep in the woods. If it was a rich area, it wouldn't have been torn down. East on Dorchester. At the center of the photo, McIlvaine came off on the right. Some houses on the left of Dorchester had been demolished only in the past few years. 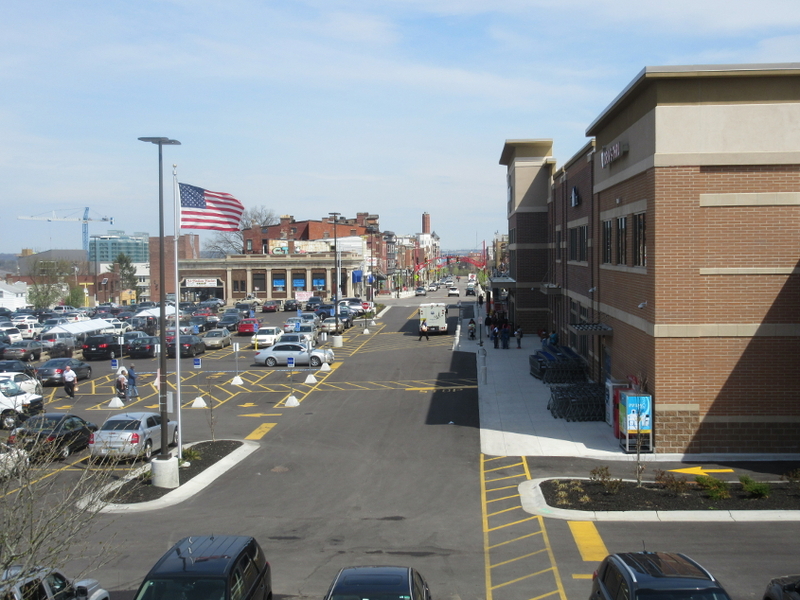 North from William Howard Taft Road, this is a view of the rebuilt University Plaza shopping center, with the new Kroger on the right. (Their bubble gum selection was just as bad as other Kroger stores.) In the distance straight ahead is Short Vine - the part of Vine Street disconnected from the part to the south. That's where a man ripped an LAP bunker blast. A fun and funny video! The Road Ruiner gives us Vine Street from just south of McMillan Street all the way to Central Parkway (where it becomes one-way)! Notice how at 7:25, at the 5-way intersection with McMicken and Findlay, some moron just cuts right out in front of me and almost causes a wreck. They were within inches! Unebelievably, some other idiot did the exact same thing at Central Parkway, right after I stopped filming.